Microsoft has the HoloLens and Google has their money on Magic Leap (as well as their own Tango and Cardboard, among others), but we've heard next to nothing about how Apple plans to enter the virtual/augmented/mixed reality space. 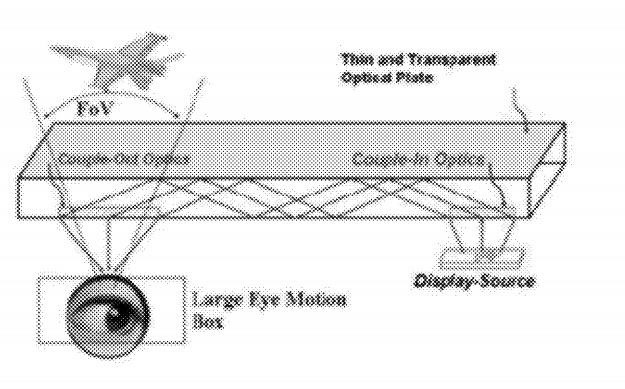 A new patent offers some clues. Apple could take the approach of a headset tethered to an iPad or iPhone. and use the set of peripheral conditioning signals to control colors emitted from peripheral light element. If it isn't obvious from reading it, that filing tells us next to nothing about what Apple plans to do. That patent could describe a variety of headsets, but it does make it clear that Apple is at least pursuing hardware development in the mixed/virtual reality space. What that'll amount to is anyone's guess, but given their focus on mobile and their lack of interest in offering decent gaming hardware for the desktop, Apple could take the approach of a headset tethered to an iPad or iPhone. Microsoft's HoloLens runs on mobile hardware, but only manages three hours of battery life due to its relatively small size and complex computing. Most other headsets in the VR/AR/MR space remain tethered to a computer to harness additional power. It would make sense to settle somewhat in the middle and tether to the phone they want you to already own and upgrade. A peripheral of this nature could easily connect to an iOS device of significant power through Apple's proprietary Lightning port and use the phone's processing power and battery to supplement the headset. Don't Miss: What's the Difference Between Virtual, Augmented, & Mixed Reality? Of course, this is all speculation and Apple could come up with something completely surprising. Given their history as of late, however, their products tend to be rather predictable. You'll find the best selection of mobile games on iOS, and Apple loves getting you to buy more peripherals that keep you in their ecosystem, so it stands to reason we'll see their headset require that you own an iOS device.